My name is EVELINA PHILLIPS and I am a TOP-NOTCH BUYERS REPRESENTATIVE who knows this Tampa area inside and out! I am a buyer agent who is also a certified Accredited Buyer Representative (ABR) and that holds me to the highest of buyer standards for my clients. I have over 10 years of Buyer agent home buying experience. As a Buyers Agent I have assisted hundreds of buyers with locating and following through from contract to closing on their homes. I have lived in the Tampa area for over 10 years. I am originally a New Jersey native, but once I moved to Tampa, I fell in love with the never ending sunshine, the warm people and the beautiful white sandy beaches. Now, I call Tampa Florida my new home! As an accredited buyer representative, you can count on me to look out for your best interest and guard the price that you will pay for your new home. When buying your house, it is best to look at all of the aspects of the home not only looks, but price and location in the community and also consider the surrounding area as well. As a buyers agent, I am very familiar first hand with the anxiety of moving to a new area, trying to determine where the best location would be to live for you and your family. I know that it is a daunting task to find the "right" home and location. Let my buyer agency experience work for you to find the right home at the right price, including all the neighborhood amenities that matter - not to mention the essential criteria that you want in your home. As your buyer representative, I will work tirelessly with you from contract to closing to get you in the home you want to be in. As as buyer agent I specialize in Single Family Homes, Town homes and Condos. I have helped hundreds of homeowners, and worked with them to purchase Bank Owned Properties, Short Sale Properties, New Homes and existing residential Properties. If you are looking for the best price and location for a home call EVELINA PHILLIPS, your personal BUYERS AGENT at 813-810-7001 and let this buyers agent show you that buying your new house can be fun and you can experience first hand how easy home ownership can be! When it's time to move and you want to know how to sell your house, and need to sell it in the SHORTEST MARKET TIME at the HIGHEST MARKET PRICE call on one of the top listing agents in the area, KAREN BLOMSTER. 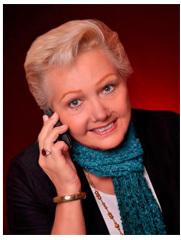 Karen has over 34 years of selling experience as a TOP PRODUCING listing agent in the Brandon and surrounding areas. She has assisted over 2800 happy moves! Karen keeps a sharp eye on current housing trends and constantly reinvests her time in real estate education. Karen as your listing agent will work personally with you from marketing your home to handing all of the paperwork necessary and following through to the closing table. YOU are always in control and Karen will work with you to decide on the best marketing plan for your home and get it started right away! As part of her Listing Agent duties, she will a keep you abreast of any new homes that pop up for sale in your neighborhood while you are selling yours, so that you can always stay one step ahead of your competition. Give her a call and let her show you how to market your property so that your home "stands out in the crowd" in this complex housing marketplace where New Home Sales, Short Sales and Bank Owned Properties are ever present! She will advertise your home different than the average listing agent. She personally takes an active role to market your home, and she would love to share with you how she does it and why it works. As A Top Listing Agent, she decides with YOU when, where and how often your home will be advertised. Karen is YOUR REAL ESTATE AGENT!! Selling your home in this complex market where you have to navigate around short sales and bank owned properties and make your listing stand out in the crowd is Karen's specialty. As a Top Listing Agent, Karen specializes in Single Family homes, New Homes, Condos,Town homes, Short Sales, and Bank owned properties. So, when you are ready to sell your home, for the best home marketing and customer service in the Tampa bay area, call KAREN BLOMSTER at 813-293-6919.